Representatives from all of the 50 states gathered to dedicate the new two acres of park restoration. 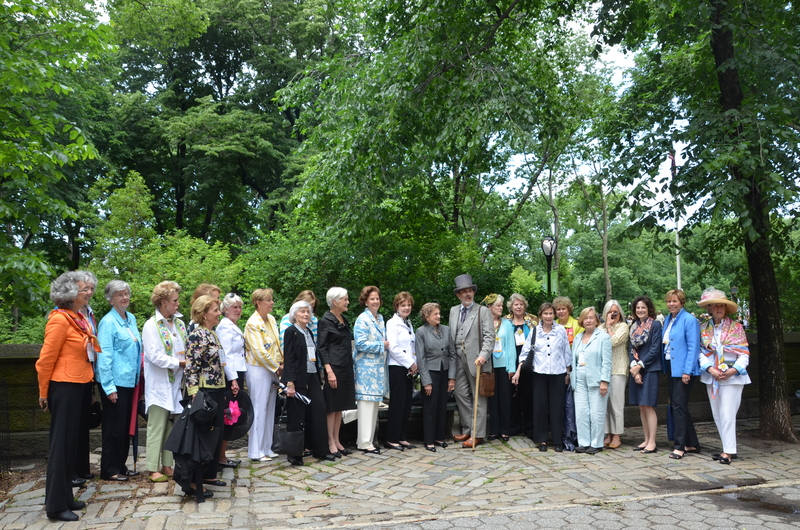 The Garden Club of America celebrated its 100th anniversary by restoring a two-acre section of Central Park. The site selection, official approvals, initial groundbreaking and final dedication ceremonies were all completed in collaboration with the Central Parks Conservancy. Receiving the award certificate on behalf of CPC was Christopher Nolan, Vice President of Planning, Design and Construction. Here Nolan is seen with Frederick Law Olmsted. GCA committed its 2013 Founders Fund for this special Centennial Project. 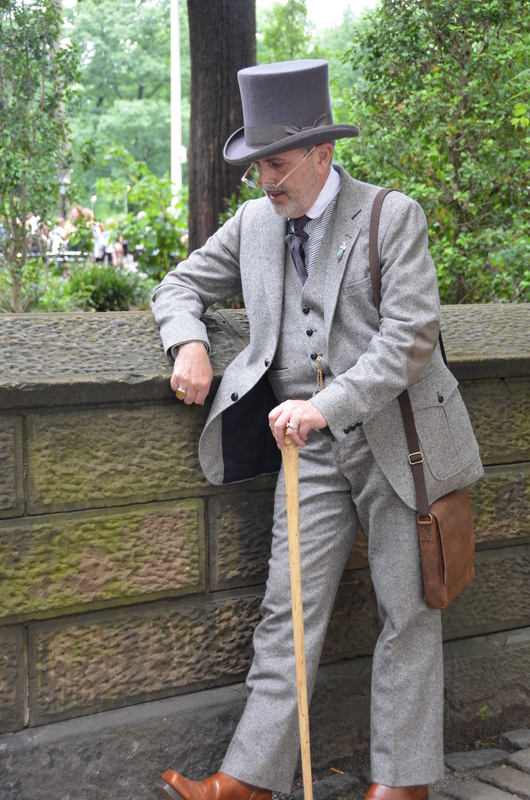 Frederick Law Olmsted in a moment of reflection next to the stone wall of his design surrounding Central Park. As this portion of the park was originally envisioned by Frederick Law Olmsted and Calvert Vaux, the woodland’s edge design brought a nature’s experience to inner city residents. 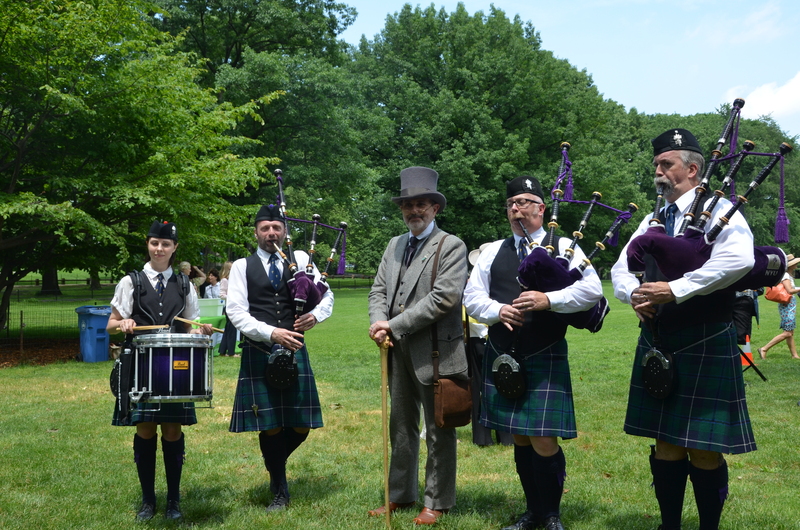 A Scottish contingent piped the assembly on to the greensward. Mayor of New York City, Michael Bloomberg proclaimed June 3, 2013 as ‘The Garden Club of America Day’ in New York City to coincide with the formal dedication ceremony. 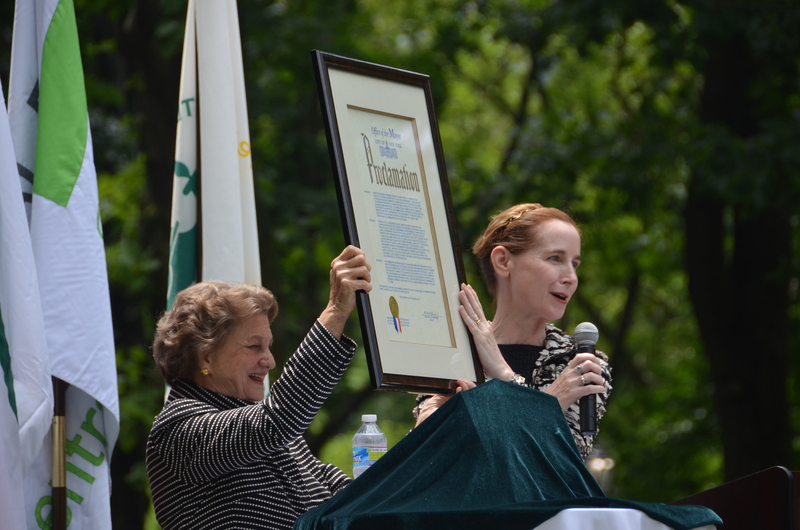 Marian Hill, President of GCA, and New York’s Park Commissioner, Veronica White, present the Proclamation. The restored landscape planting is at the East 69th Street entrance to Central Park and is only blocks away from the Metropolitan Museum of Art. 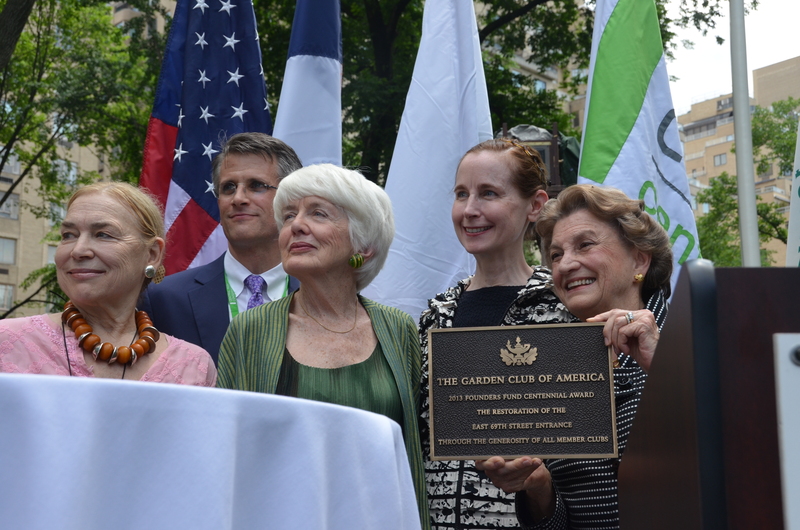 CPC/GCA Liaison Natasha Hopkinson, CPC VP Christopher Nolan, CPC Founder Betsy Barlow Rogers, NYC Parks Commissioner White & GCA President Marian Hill at dedication. 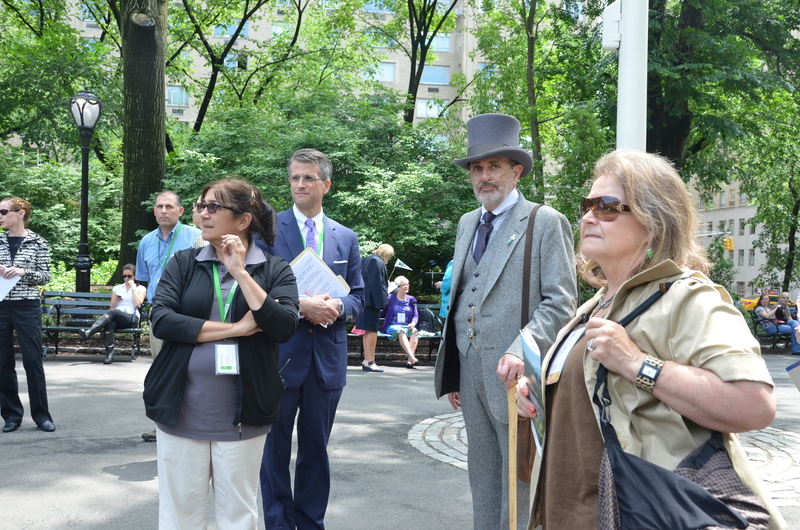 Representatives from all 50 states’ Garden Clubs were present as the director of the Central Parks Conservancy, President of the Garden Clubs of America, and notable committee members spoke to the historic principles of natural preservation recognized by this partnership. 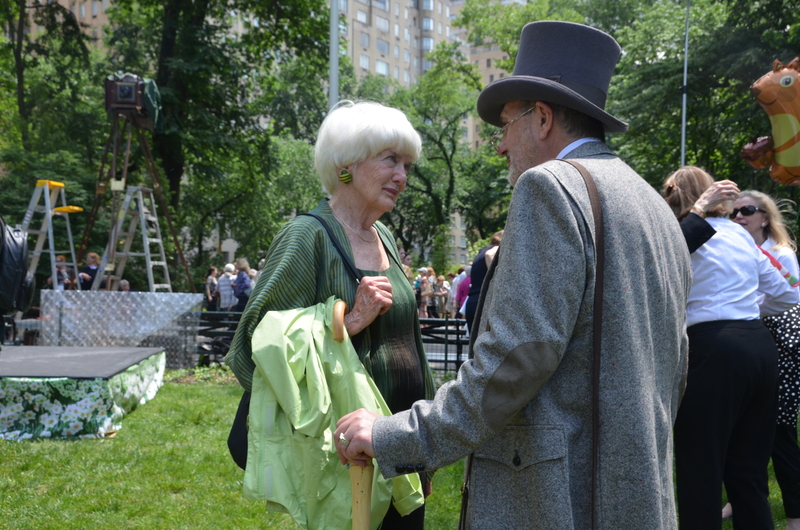 Betsy Barlow Rogers, founder of Central Parks Conservancy discusses the restoration with Frederick Law Olmsted. Rogers observed that GCA members volunteered to restore this section of the park. 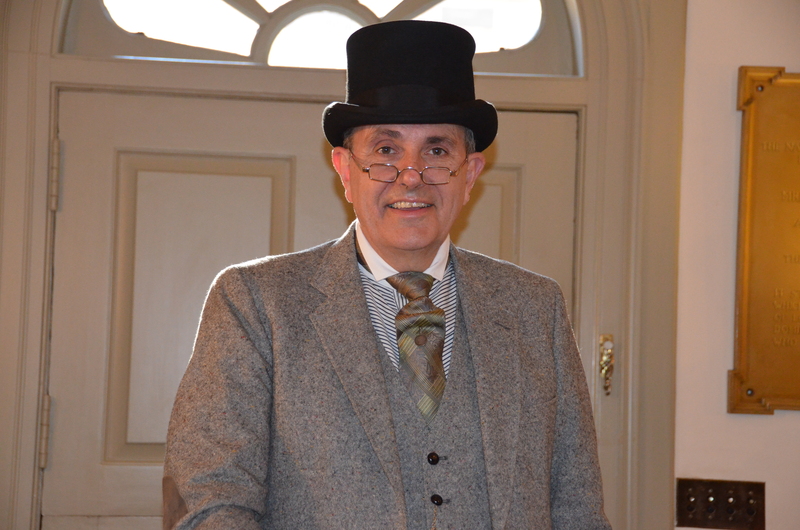 Frederick Law Olmsted was present at the ceremonies as delivered by his amanuensis, Kirk R. Brown. The day was spectacular in the warmth of a summer sun and singularity of the gardeners’ passionate dedication to their art.